We were sitting in the living room, minding our own business, when I heard music coming from outside. Not annoying someone-playing-the-radio-too-loud music. This was the tinkling sound that announced an ice cream truck. We ran to the door and watched it drive back. Fortunately, we live at the entrance of the neighborhood, so we knew it had to come back by our house. Monkey Georgia gathered her money and stood at the front door waiting. 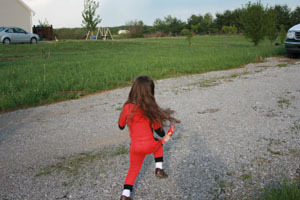 Eventually, even that was not enough, so she and Uhn-Gi stood at the end of the driveway waiting for the ice cream truck. She watched other families getting their ice cream and jumped up and down in anticipation. Finally (finally! ), the truck pulled into our driveway (safer than stopping in the street). Monkey Georgia started dancing and giggling. It was not easy to choose an ice cream. There were popsicles, ice cream bar, character bars, ice cream Snickers, and so much more. Monkey Georgia finally settled on the strawberry ice cream bar. She was so excited after she handed over her money, that she took off running up the driveway, with a skip and jump for joy thrown in for good measure. 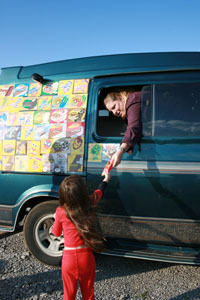 I did not get to have ice cream trucks come to my house when I was a kid because I lived so far off the beaten path. I think there were definite advantages to the situation, and I don't feel like I missed anything. I am so glad Monkey Georgia got to have this experience though. If nothing else, it was great fun to watch! What would you chose from the ice cream truck?